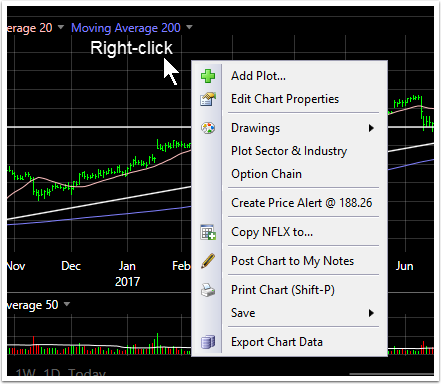 Any option can be viewed as the main chart instead of a secondary chart whenever an option is selected in a WatchList. Viewing an option as the main chart makes it easier to add indicators to the option price history or place trades from the option chart. 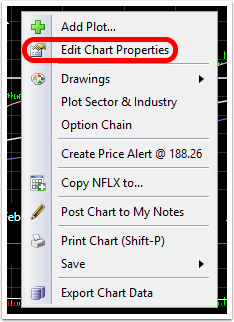 Below are the steps to change the chart settings and view the chart of an option as the main chart. (Note: multi-legged option strategy orders must be placed from the chart of the underlying stock, not an option). 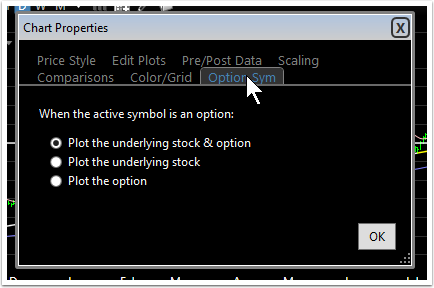 This changes the main price plot on the chart from the underlying stock to the option contract selected but only when an option (not a stock symbol) is selected..
With this chart configuration, add indicators and even trade directly from the option chart. This main chart functions exactly as an equity chart functionality would. 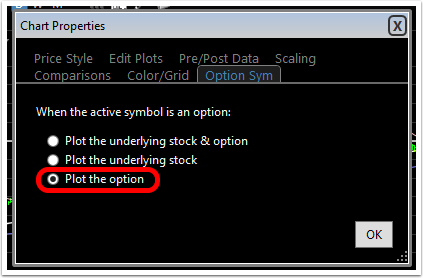 Note: Option charts set up this way will only show up when an option symbol is selected. If a stock symbol is selected, the stock's price history is the main chart.